Pretzel Spoonz – Zucconi Idea Agency, Inc. Old-fashioned crunch…in a new-fangled shape. 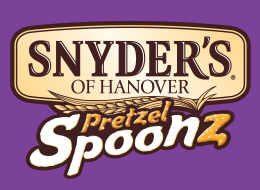 Snyder's of Hanover – America's pretzel bakery since way back in 1909 – asked us to develop the package for its innovative "Spoonz" spoon-shaped pretzels. Our involvement began in the consumer testing phase, with concept stimuli and name generation. Guided by that research, we designed an attractive, eye-catching, totally contemporary package that managed to be positively disruptive while honoring the established brand equities. But that was only part of the story. We also created a powerful context and narrative for this fun new product – photography, illustration, tagline, back-panel copy. That included creating a CGI Spoonz pretzel that could be freely manipulated and placed: a virtual stand-in for a product so new that actual samples didn't yet exist. The resulting package does more than introduce a new product. It also celebrates its unique personality and range of extended usage occasions….deliciously.